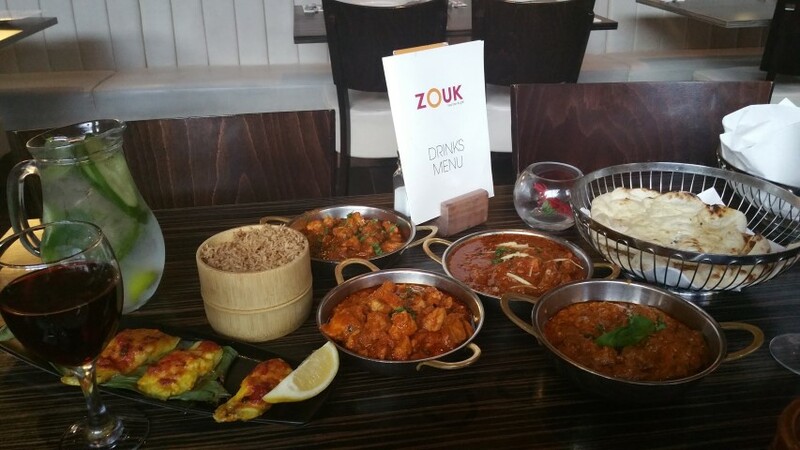 Last Thursday the My Social Agency were given a golden treat – the chance to sample renowned Indian restaurant Zouk’s new summer menu. How could our team of seasoned foodies say no? Apparently Rihanna and Drake have been spotted dining there, so by our logic if it’s good enough for the celebs, then it’s certainly good enough for us! The VIP event, in partnership with Manchester Confidential, saw guests presented with a well-orchestrated menu featuring some of the restaurant’s finest dishes. Each item was also complemented by the most apt wines of the world. A sauvignon blanc from New Zealand was recommended with the spiced sea bream, and Chilean red wine rounded with hints of cherry and raspberry for the lamb dishes. The latter was my favourite given my sweet tooth – and let’s say we may have enjoyed more than a little! In fact we were glad to have saved ourselves in preparation for our evening at the Chester Street restaurant. A “taster menu” would usually have you anticipating merely a few bites that just about tide you over, yet the guys at Zouk clearly had a lot more in store. I’d struggle to tell you which item from the menu was my favourite, as they were all close contenders, but the crispy tava lamb in pancakes, mozzarella balls, chicken khabani, and lamb laziz were certainly up there. Anxious about leaving with a burnt tongue, I can often be wary of trying hot Indian dishes, yet here the punjabi aromatic spices possessed a zingy kick that enhanced the meat’s flavour as opposed to distorting. And I have to say, the team at Zouk gained bonus points for their service. It was friendly, but not overbearingly so. There’s nothing worse than a waiter that checks up on you in between every mouthful, just as much as a waiter that interprets professionalism as faking a posh accent and being rather clipped. Here I could slide back into my seat and genuinely enjoy the food and company as we were tended to. And what’s more, restaurant owner Tayub seemed more than happy to pop over to our table to see how we were doing, rolling his head back in laughter at our poor jokes before checking in on the kitchen’s action. It’s the sort of treatment that leaves you with a fuzzy glow – you know you’re in the hands of people who care. But what’s a night without entertainment? In this case we had Desi Nash performers showcasing western-infused baghra dances around the tables every half hour or so, their smiles unfaltering as they writhed their hips around in Bollywood attire to the song ‘Jai Ho’. I was lucky enough to grab a snap of them before they bundled themselves away into the changing area at the back. Look at how beautiful they are! On top of this we had an open invite to join waiters Mohammed and Samy in the refurbished terrace for a watermelon shisha under the heated lamps. Thankfully it’s a sheltered area so we were nestled away from the evening’s downpour. It was truly an honour to be so well looked after in such a warm atmosphere. So, Zouk, cheers for a great time! We would like to extend our thanks to all the staff with a special shout-out to Tayub, Mudassar, Helen, Cheryl, and Jack for their hospitality and for organising the evening. Hopefully we’ll be back to see you again soon!